The Dallas Cowboys, defending NFL Champions, were seeking to clinch a fifth straight NFC East title as they hosted the New England Patriots on December 15, 1996. Head Coach Barry Switzer’s Cowboys were still a strong team with an offense based around the troika of QB Troy Aikman, RB Emmitt Smith, and WR Michael Irvin and a defense that was top-ranked against the pass. But Smith was playing hurt much of the year and Irvin missed time due to a drug suspension, one of many off-field distractions that dogged the club. DE Leon Lett would be missing the contest against the Patriots, also due to a drug suspension. But despite the problems, Dallas was 9-5 and, at the very least, still the best team in its division. The Patriots, coached by Bill Parcells, had a 10-4 record and were already assured of a playoff berth. QB Drew Bledsoe directed a pass-oriented offense and had WR Terry Glenn, who quickly established himself as an impact player in his rookie season despite playing with a nagging hamstring injury, as his main target. Second-year RB Curtis Martin was outstanding running the ball. The defense had been unimpressive earlier in the season but appeared to be coming together as the postseason approached. There were 64,578 fans in attendance Texas Stadium. The Cowboys had the first possession and punted. New England responded by driving 61 yards in 10 plays. Curtis Martin started things off with a 21-yard carry and Drew Bledsoe threw to Terry Glenn for 19 yards to the Dallas 25. A 10-yard run by RB Dave Meggett converted a third-and-10 situation but, after getting first-and-goal from the four yard line, Bledsoe threw three incomplete passes in the end zone and the Patriots settled for a 21-yard field goal by Adam Vinatieri. The Cowboys no sooner got the ball again when CB Ty Law intercepted an Aikman pass to give New England possession at the Dallas 30. Bledsoe completed three short passes and the Patriots again ended up with a Vinatieri field goal, this time from 30 yards. The Patriots were up by 6-0, but that would prove to be the high point of the game for them. Dallas responded quickly when RB Herschel Walker returned the ensuing kickoff 70 yards to the New England 19. While the Cowboys had difficulty moving the ball from there on offense, Chris Boniol booted a 23-yard field goal. The Patriots came back on a series that extended into the second quarter. Bledsoe threw a screen pass to FB Keith Byars for a 19-yard gain and, two plays later, hit Byars again for 16 yards. But after reaching the Dallas 16, Martin fumbled on a third down carry and DT Chad Hennings recovered for the Cowboys. The teams traded punts before Dallas put together a nine-play, 51-yard scoring drive. Aikman threw to Emmitt Smith on a third-and-two play to gain 21 yards as he broke two tackles along the way and the star running back followed up with three consecutive eight-yard carries before being shaken up and having to leave the game. Boniol kicked a 36-yard field goal to tie the score at 6-6. New England drove to just past midfield as the game moved into the last two minutes of the first half, but a pass was intercepted by safety Roger Harper to end the threat. The score remained tied at halftime. Following a punt by the Patriots after their first series of the third quarter, the Cowboys advanced 69 yards in 13 plays. 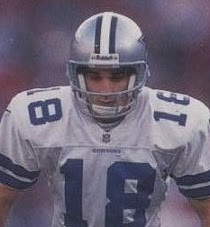 Aikman had completions to Michael Irvin for 15 yards and WR Kevin Williams for 19 yards along the way, Smith had six carries for 26 yards, and a defensive holding penalty converted a second-and-10 situation before the drive ended at the New England 17 and Boniol kicked his third field goal, from 35 yards. On New England’s third play after receiving the ensuing kickoff, SS Darren Woodson (pictured at top) intercepted a Bledsoe pass and returned it 21 yards to the New England four. The Patriots held on defense, actually backing the Cowboys up seven yards, and Boniol booted a 29-yard field goal. The visitors reached the Dallas 48 on their last series of the period, but Bledsoe threw an incomplete pass on fourth-and-one to give the ball back to the home team. Aikman threw to Irvin for 20 yards and the Cowboys reached the New England seven, but on the second play of the fourth quarter Aikman threw into the end zone and Law intercepted for the second time. The teams exchanged punts before the Patriots again threatened, advancing to the Dallas 23. The big play was a Bledsoe pass to Glenn for 29 yards, but once again New England came up empty when trying to convert a fourth down. After the Cowboys managed to burn over three minutes off the clock before punting, the Patriots took over at their 18 with 2:33 remaining. Bledsoe threw to WR Troy Brown for nine yards but then was picked off by Woodson. It turned out to be their last chance – Williams gained nine yards on a third-and-seven end-around to clinch the surprisingly low-scoring 12-6 win for Dallas. In a game dominated by the defenses, the Patriots had the edge in total yards (279 to 251) while the clubs were even with 16 first downs apiece. New England turned the ball over four times, to two suffered by the Cowboys. Moreover, the Patriots had come into the game leading the league by scoring an average of 28 points-per-game, but were held to just six points and no touchdowns by the Dallas defense. Troy Aikman completed 16 of 28 passes for 169 yards and gave up two interceptions. Emmitt Smith rushed for 85 yards on 27 carries and added another 55 yards on 5 pass receptions. Michael Irvin led the club with 6 catches for 76 yards. 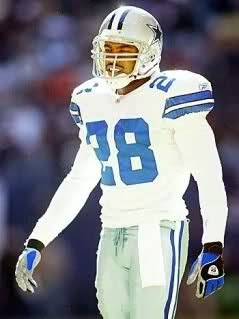 Darren Woodson had two big interceptions on defense and Chris Boniol (pictured at left) was successful on all four of his field goal attempts. For the Patriots, Drew Bledsoe was successful on 20 of 40 throws for 178 yards and was picked off three times. Curtis Martin had 91 rushing yards on 20 attempts. Terry Glenn caught 8 passes for 83 yards and Keith Byars contributed 5 receptions for 46 yards. On defense, Ty Law accounted for both of the team’s interceptions. “I told the team they ought to be damn proud of the fact they’re the first team to ever win five consecutive NFC East titles,” said Coach Switzer. Irvin’s pessimism was not fully justified as the Cowboys, who finished with a 10-6 record, easily got past Minnesota in the Wild Card playoff round. However, they lost to the upstart Carolina Panthers in the Divisional round – the club’s earliest departure from the postseason since 1991. New England ended up winning the AFC East at 11-5 and advanced all the way to the Super Bowl before losing to Green Bay.